Maybe it was the Tenacious or perhaps a Delica . Just can’t remember. Aluminum-handled Civilian. Bought it in 1996-97, probably? I don't remember exactly, but it was sometime in that era. I still have it, although for obvious reasons it's one of my more infrequently carried knives. 1st generation serrated Delica in AUS8 sometime in the early 90s. Its teeth will make a dentist weep but it still comes out every now and then for some fresh air and to tell the newer models ‘bout the good old days. Its the grizzled, belligerent vet in my collection. The gen 1 plain edge Endura that followed it didn’t have nearly as rough a life. 440C spyderfly in 2004-2005. Wouldn't buy another spyderco until 2009. Then came the delica 4 SS and my membership to the forums. Mine was an aluminum Peter Herbst. First ever liner lock for me, so almost totally disappointing in that it was wrong handed and the right side was unattractive, but the Spyderhole convinced me to keep trying. An S30V FRN Native was the first one I liked and a jigged bone Kiwi was first one I loved. Native 5 LW in S110V steel. I bought two at the same time: a Centofante 3 and a SS Jester. DLC Tenacious, it's our most used knife at home because it's in the kitchen "stuff" drawer. We use it a few times a day to cut all sorts of things, open packages, cut up boxes for recycling. Honestly, it's all the knife I would every really need...but what's the fun of that! Most days I carry the 204 Mili, but I recently switched to the Shaman to "try it out for a while". The Shaman has not left my side since. I think I have a knife addiction. Specifically, a Spyderco knife addiction. Before Spyderco I was really into black coated, plain edge knives. Most of my purchases were Benchmade, MOD & Microtech. When I saw this model I had to have it. After holding it in hand, I was hooked. Haven't looked back since. A CF Chaparral in May 2018 - 16 or 17 since then. I really don't have a problem. Marvelous, just like it should be. I held off for over a year waiting on this one to come out, it was a feeding frenzy and sold out in less than an hour. I'm glad that I decided to grab 2 at the time. Definitely my most carried Spydie to date. Last edited by Airlsee on Thu Oct 25, 2018 10:23 am, edited 1 time in total. I got my first while deployed in Iraq in 2009. It was a gift from a group of guys I worked with alot. 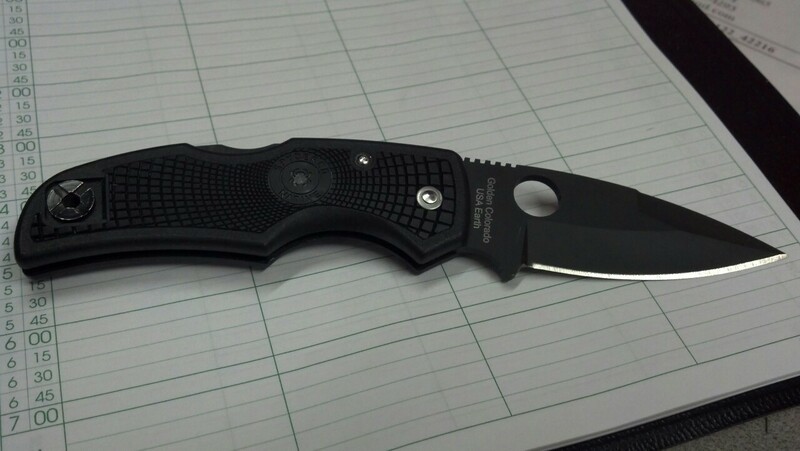 Delica4, saber grind combo edge, black with black dlc. I did things with this knife that I never thought possible out of a blade. I was 100 percent sold on Spyderco after that. I had a scare in 2014 and thought I had lost it and came to the realization that I needed to officially retire it. I put a pm2 digi camo on order and 100 other models since then. With that being said..if I ever had to pick one and bet my life on it. My original delica 4 all the way! The original PE military in cpm-440v. Late 90's, if I'm,not mistaken. I gave up trying to sharpen it. I wanna say early to mid 90's Endura with the red trim... I bought 4 of them... this was the first, I used and lost the second and I still have three and four in their boxes! My first product from from Spyderco has been a Sharpmaker, it was in the gone century. Some years later followed a Delica CF Sprint Run or a Military, I can't remember. All three are still in my property and meanwhile the Sharpmaker is well used. My first Spyderco was a Pacific Salt with a hollow grind. It was given to me as a wedding gift in 2017. I was a few years into knife collecting (on a much smaller scale than I am today), and always saw the round hole as more of a gimmicky trendy thing, rather than a useful design. Didn’t touch it for months (too afraid to scratch the H1 further than it was when I got it). I then get bored one day, and allowed Nutnfancy to unknowingly talk me into buying a Manix 2 LW which didn’t leave my side for a few months. It all started, October '16, with a Persistence. Just to see what the deal was with these odd looking knives. After dipping my toe in the water, so to speak, I now carry a snorkel! I have thirteen now plus five byrds. Police about 14 years ago.